It’s Spring Break season again! For country fans that means it’s time for Luke Bryan to release his fourth annual Spring Break EP. This is the first video from the four song release for the 2012 version of the series. Check out Suntan City. Soon the sun will be shining all over the country. 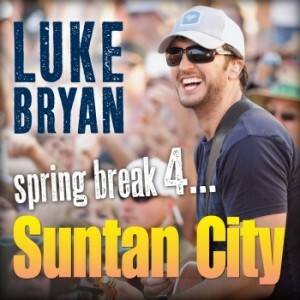 It’s spring break season and that means another release from Luke Bryan. For the last four years Luke has made it a point to release four new songs with the spring break theme. The anticipation has been growing each year as Luke becomes a bigger and bigger star. The first video release this year is Suntan City and Luke doesn’t disappoint. The song is right on point with the spring break theme. It’s a story told from the point of a guy down in Florida just enjoying the girls and the sun during his spring break. Spring is a time to be sittin’ pretty and enjoying the weather wherever you are. Luke will head down to Florida for his annual spring break concert and I envy you if you’ll be down there with him next month. The weather is still chilly here in Wisconsin, but things should be heating up soon. It’s pretty cool that Luke Bryan releases these songs every year. It’s something a little extra for his fans. Most artists don’t do things like this. In fact, I don’t think any other big time artist really does anything like this. Mostly they all focus on releasing their radio-friendly songs and focus on their main album releases. Luke is proving that you can still have the radio songs and the albums on the top of the charts and still have a little fun on the side. I love the spring break series and can’t wait to pick this entire four song EP up when it drops next month. For now, check out the video and share your thoughts on sittin’ pretty in Suntan City.